Our recently featured story — JoAnn and Mark’s retro retirement playhouse — with its many vintage pieces and Haywood-Wakefield influenced style — inspired a deeper look into tambour. The artful use of tambour in JoAnn’s kitchen — wrapping the island, support post and counter end — not only looks great but is period appropriate. But where does one acquire tambour for such a project? JoAnn kindly revealed her source — WoodWaves.com — which carries many different species and styles like the round maple tambour she used — perfect for retro renovations. Blonde bedroom furniture with tambour doors. Barzilay modular storage with tambour doors. 1978 St. Charles kitchen with tambour-style overlay doors. We’ve been making tambour for over 20 years, but have been in the furniture industry for approximately 35 years. Tambour was primarily used for roll top desks and sliding doors, but, now can be used as decorative architectural panels. It has been used in restaurants, banks, and hotels. 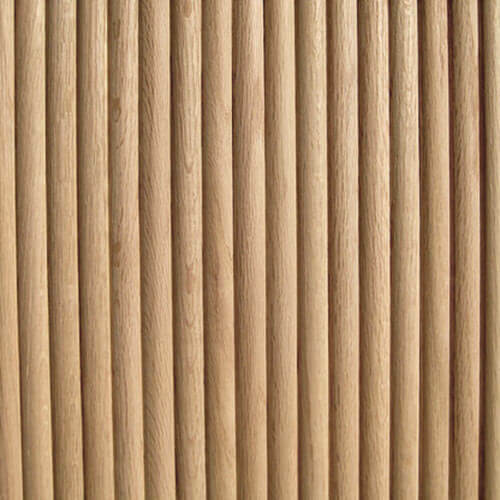 Our tambour comes in a variety of woods such as Red Oak, Maple, Cherry, Alder, Hickory, and Pine. We have Round, Flat, Pencil, Thin Flat, Thin Round, Grid, Shutter, and Butcher Block style tambour. 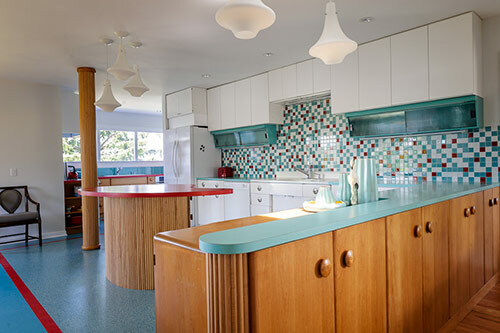 Tambour is a great option for use in retro kitchens — as a wrap around detail for islands, ends of counters or otherwise unsightly support posts. Tambour would also be a great addition to basement rec rooms (which also often include unsightly support posts). Planning a tiki bar themed room? Tambour would be a great material to use for wrapping the bar front — or create an accent wall or chair rail. The possibilities are endless. Woodwaves also sells some mid century modern style furniture — many of which have tambour doors — like the media cabinet above. Using tambour is a great way to apply wood to curved surfaces — creating texture and dimension. In a midcentury modern houses — where a focus on the use of natural materials may be prevalent — tambour is a great way to consider incorporating wood, with a little more oomph. 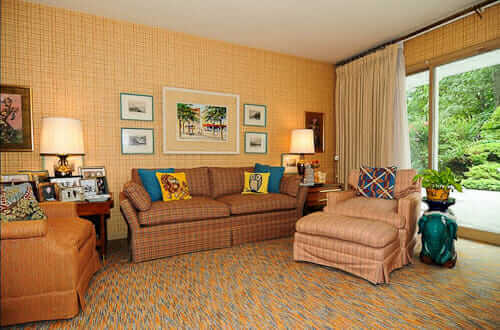 The entertainment/tv stands could really help a modern tv blend into a mid mod room. Their tables are great too. Thanks for sharing this resource. Love all the looks! The media cabinets are fabulous! That media cabinet is gorgeous! I love the metal legs!